2012 不適用 Cameras Ryan 集數："Walrus"
2017 不適用 Chopped Junior Judge 集數："Three Ring Kitch"
^ Ryan Anthony Guzman. FamilySearch.org. [January 25, 2015]. （原始内容存档于2015-01-25）. 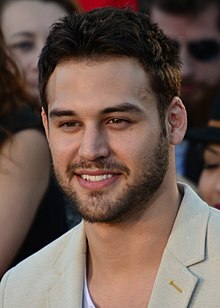 ^ Ryan Guzman steps into lead role in ‘Revolution’. Boston Herald. July 25, 2012 [June 22, 2013].